Researchers in MIT’s Media Lab have bypassed a major design step in 3-D printing — quickly and efficiently modeling and printing thousands of hair-like structures. Instead of using conventional computer-aided design (CAD) software to draw thousands of individual hairs on a computer — a step that would take hours to compute — the team built a new software platform called “Cilllia” that lets users simply define the angle, thickness, density, and height of thousands of hairs in just a few minutes. Using the new software, the researchers designed arrays of hair-like structures at a resolution of 50 micrometers — about the width of an average human hair. They then designed and printed arrays, ranging from coarse bristles to fine fur, onto flat and also curved surfaces, using a conventional 3-D printer. The goal was to perform useful tasks such as sensing, adhesion, and actuation … and maybe create a few toys. 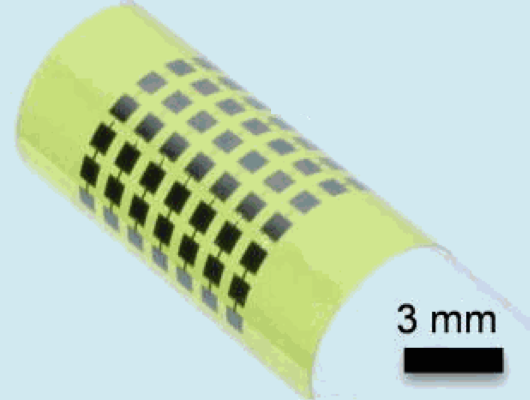 To demonstrate adhesion, the team printed arrays that act as Velcro-like bristle pads. Depending on the angle of the bristles, the pads can stick to each other with varying forces. For sensing, the researchers printed a small furry rabbit figure, equipped with LED lights that light up when a person strokes the rabbit in certain directions. And to see whether 3-D-printed hair can help actuate, or move objects, the team fabricated a weight-sorting table made from panels of printed hair with specified angles and heights. As a small vibration source shook the panels, the hairs were able to move coins across the table, sorting them based on the coins’ weight and the vibration frequency. “[Hair] comes with a challenge that is not on the hardware, but on the software side,” says Jifei Ou, lead author on a paper presented at the Association for Computing Machinery’s CHI Conference on Human Factors in Computing Systems in May. To 3-D-print hair using existing software, designers would have to model hair in CAD, drawing out each individual strand, then feed the drawing through a slicer program that represents each hair’s contour as a mesh of tiny triangles. The program would then create horizontal cross sections of the triangle mesh, and translate each cross section into pixels, or a bitmap, that a printer could then print out, layer by layer. Ou says designing a stamp-sized array of 6,000 hairs using this process would take several hours to process. “If you were to load this file into a normal slicing program, it would crash the program,” he says. Using these techniques, the team printed pads of Velcro-like bristles, and paintbrushes with varying textures and densities. Printing hair on curved surfaces proved trickier. 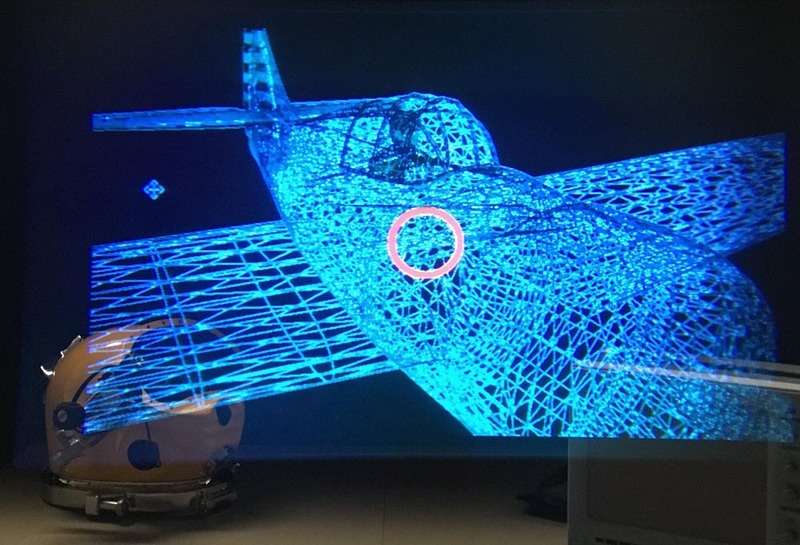 To do this, the team first imported a CAD drawing of a curved surface, such as a small rabbit, then fed the model through a slicing program to generate a triangle mesh of the rabbit shape. They then developed an algorithm to locate the center of each triangle’s base, then virtually drew a line out, perpendicular to the triangle’s base, to represent a single hair. Doing this for every triangle in the mesh created a dense array of hairs running perpendicular to the rabbit’s curved surface. The researchers then used their color mapping techniques to quickly customize the rabbit hair’s thickness and stiffness. Among other applications, Ou says 3-D-printed hair may be used in interactive toys. To demonstrate, his team inserted an LED light into the fuzzy printed rabbit, along with a small microphone that senses vibrations. With this setup, the bunny turns green when it is petted in the correct way, and red when it is not. * The researchers modeled a single hair by representing an elongated cone as a stack of fewer and fewer pixels, from the base to the top. To change the hair’s dimensions, such as its height, angle, and width, they simply changed the arrangement of pixels in the cone. To scale up to thousands of hairs on a flat surface, Ou and his team used Photoshop to generate a color mapping technique. They used three colors — red, green, and blue — to represent three hair parameters — height, width, and angle. For example, to make a circular patch of hair with taller strands around the rim, they drew a red circle and changed the color gradient in such a way that darker hues of red appeared around the circle’s rim, denoting taller hairs. They then developed an algorithm to quickly translate the color map into a model of a hair array, which they then fed to a 3-D printer. This work presents a method for 3D printing hair-like structures on both flat and curved surfaces. It allows a user to design and fabricate hair geometries that are smaller than 100 micron. We built a software platform to let users quickly define the hair angle, thickness, density, and height. 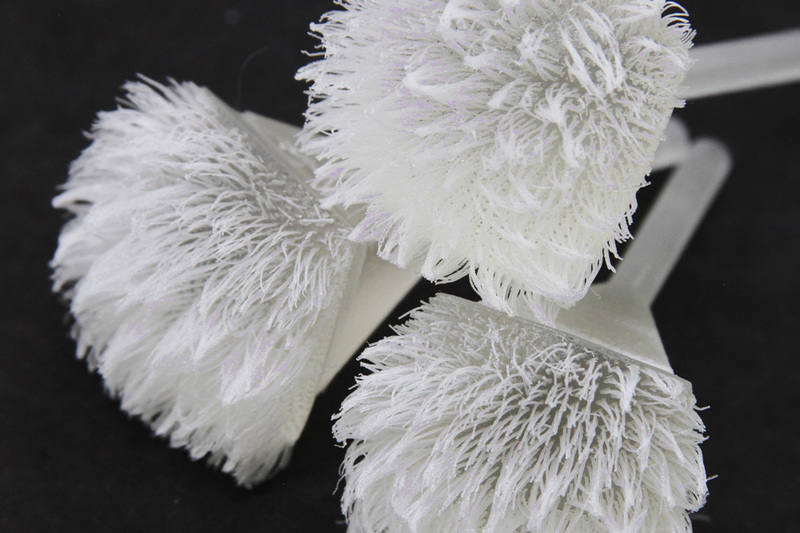 The ability to fabricate customized hair-like structures not only expands the library of 3D-printable shapes, but also enables us to design passive actuators and swipe sensors. We also present several applications that show how the 3D-printed hair can be used for designing everyday interactive objects. Chinese supercomputers maintained their No. 1 ranking on the 47th edition of the TOP500 list of the world’s top supercomputers, announced today (June 20). The new Sunway TaihuLight supercomputer operates at 93 petaflop/s (quadrillions of calculations per second) Rmax on the LINPACK benchmark — twice as fast and three times as efficient as China’s Tianhe-2 (at 33.86 petaflop/s), now in the #2 spot. The new supercomputer was developed by the National Research Center of Parallel Computer Engineering & Technology (NRCPC) and installed at the National Supercomputing Center in Wuxi in China’s Jiangsu province. The complete system has a theoretical peak performance of 125.4 Pflop/s, with 10,649,600 cores and 1.31 PB of primary memory, according to a report by Top500 co-compiler Jack Dongarra of the University of Tennessee. The newest edition of the semiannual TOP500 list was announced today at the 2016 International Supercomputer Conference in Frankfurt. The latest list marks the first time since the inception of the TOP500 that the U.S is not home to the largest number of systems. China now leads with 167 systems and the U.S. is second with 165. China also leads the performance category, thanks to the No. 1 and No. 2 systems. Titan, a Cray XK7 system installed at the Department of Energy’s (DOE) Oak Ridge National Laboratory, is now the No. 3 system, at 17.59 petaflop/s. Sunway TaihuLight was also built entirely using processors designed and made in China (Tianhe-2 was built with Intel processors). However, because of funding shortages and technology challenges, “there has been a delay in getting the exascale launched in the U.S., and as a result, we’re further behind than we should be,” Dongarra told the Times, noting that the Chinese government is committed to reaching the exascale goal by the end of this decade. Cray continues to be the leader in the TOP500 list in total installed performance share, with 19.9 percent (down from 25 percent). Thanks to the Sunway TaihuLight system, the National Research Center of Parallel Computer Engineering & Technology takes the second spot with 16.4 percent of the total performance — with just one machine. IBM takes the third spot with 10.7 percent share, down from 14.9 percent six months ago. For the first time, the data collection and curation of the Green500 project, which ranks supercomputers by energy efficiency, is now integrated with the TOP500 project. The most energy-efficient system and No. 1 on the Green500 is Shoubu, a PEZY Computing/Exascaler ZettaScaler-1.6 System achieving 6.67 GFfops/Watt at the Advanced Center for Computing and Communication at RIKEN in Japan. Total combined performance of all 500 systems has grown to 566.7 petaflop/s, compared to 420 petaflop/s six months ago and 363 petaflop/s one year ago. There are 95 systems with performance greater than a petaflop/s on the list, up from 81 six months ago. Intel continues to provide the processors for the largest share – 455 systems or 91 percent – of the TOP500 systems. The share of IBM Power processors is now at 23 systems, down from 26 systems six month ago. The AMD Opteron family is used in 13 systems (2.6 percent), down from 4.2 percent on the previous list. Scientists in South Korea have designed ultra-thin photovoltaics that are flexible enough to wrap around a thin glass rod. The new solar cells could power wearable electronics like smart watches and fitness trackers. “Our photovoltaic is about 1 micrometer thick” (the thinnest human hair is about 17 micrometers), said Jongho Lee, an engineer at the Gwangju Institute of Science and Technology in South Korea. Standard photovoltaics are usually hundreds of times thicker, and most other thin photovoltaics are 2 to 4 times thicker, he explained. The researchers made the ultra-thin solar cells from the semiconductor gallium arsenide. They stamped the cells directly onto a flexible substrate without using an adhesive (which would add to the material’s thickness). The cells were then “cold welded” to the electrode on the substrate by applying pressure at 170 degrees Celsius and melting a top layer of material called photoresist, which acted as a temporary adhesive. The photoresist was later peeled away, leaving the direct metal-to-metal bond. The metal bottom electrode layer also serves as a reflector to direct stray light back to the solar cells (to increase current output). The researchers tested the efficiency of the device at converting sunlight to electricity and found that it was comparable to thicker photovoltaics. The team performed bending tests and found the cells could wrap around a radius as small as 1.4 millimeters. They also performed numerical analysis of the cells, finding that they experience one-fourth the amount of strain of similar cells that are 3.5 micrometers thick. A few other groups have reported solar cells with thicknesses of around 1 micrometer, but have produced the cells in different ways, for example, by removing the whole subtrate by etching. By transfer-printing instead of etching, the new method developed by Lee and his colleagues could be used to make very flexible photovoltaics with a smaller amount of materials, according to Lee. The thin cells can also be integrated onto glasses frames or fabric and might power the next wave of wearable electronics, Lee said. The researchers report the results in an open-access paper in the journal Applied Physics Letters, from AIP Publishing. * (a) Schematic illustration of a film stamp with vertical gallium-arsenide microcells fabricated and isolated from the epitaxially grown source wafers. The photoresist (PR) temporarily holds the solar microcells on the source wafers. (b) The bottom electrode, which also serves as a back reflector, is deposited onto the backside of the ultra-thin vertical GaAs microcells. (c) After the film stamp is brought into contact with the receiver substrate, heat (∼170 °C) and pressure (∼80 kPa) are applied to melt the PR to serve as an adhesive. (d) Cross-sectional scanning electron microscope (SEM) image of the microcell covered with the adhesive (PR) on the receiver substrate after the printing process. The bottom electrode is in direct contact with the Au layer on the receiver substrate. 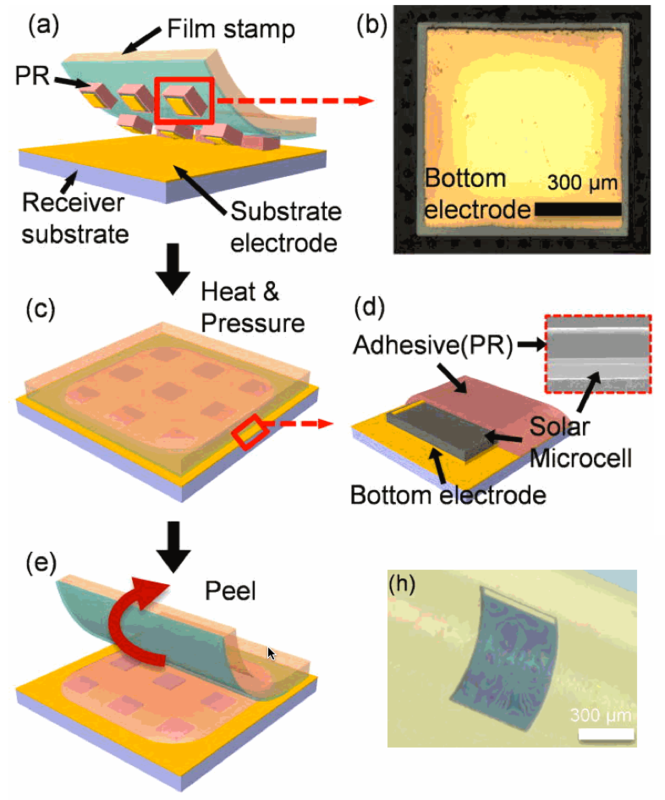 (e) Peeling the film stamp leaves the vertical ultra-thin solar microcells on the receiver substrate. (h) An optical image of the microcell wrapped on a glass slide with a radius of 1 mm. The microcell is encapsulated with a thin epoxy layer (thickness ∼2 μm). 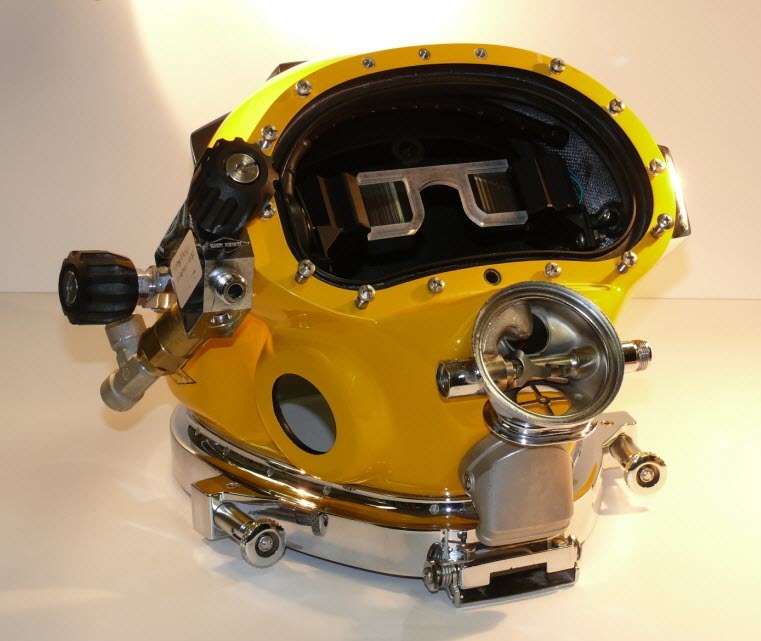 The U.S. Navy’s Naval Surface Warfare Center has developed what may be the first underwater augmented-reality head-up display (HUD) built into a diving helmet. 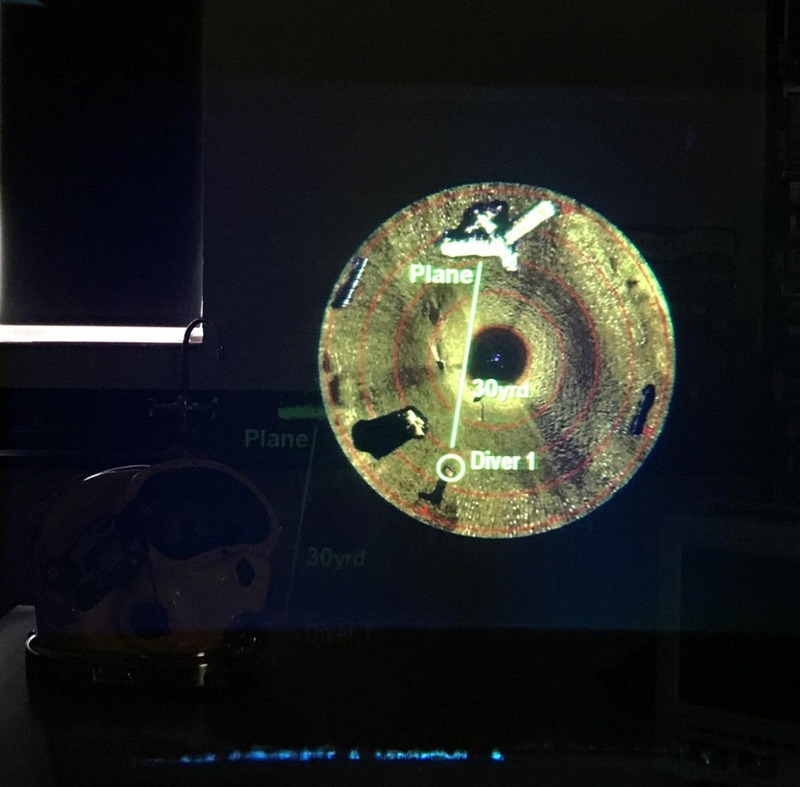 The Divers Augmented Vision Display (DAVD) gives divers a real-time, high-res visual display of everything from sector sonar (real-time topside view of the diver’s location and dive site), text messages, diagrams, and photographs to augmented-reality videos. Having real-time visual data enables them to be more effective and safe in their missions — providing expanded situational awareness and increased accuracy in navigating to a ship, downed aircraft, or other objects of interest. The Naval Sea Systems Command is now developing the next generation of the DAVD, with enhanced sensors such as miniaturized sonar and video video systems to enable divers to see in higher resolution up close, even when water visibility is near zero. Could deep-learning systems radically transform drug discovery? Scientists at Insilico Medicine have developed a new drug-discovery engine that they say is capable of predicting therapeutic use, toxicity, and adverse effects of thousands of molecules, and they plan to reveal it at the Re-Work Machine Intelligence Summit in Berlin, June 29–30. Drug discovery takes decades, with high failure rates. Among the reasons: irreproducible experiments with poor choice of animal models and inability to translate the results from animal models directly to humans, the wide variety of diseases, and communication difficulties between scientists, managers, venture capitalists, pharmaceutical companies and regulators. And perhaps the biggest problem: the slow-paced, bureaucratic culture in the pharmaceutical industry, the researchers note. 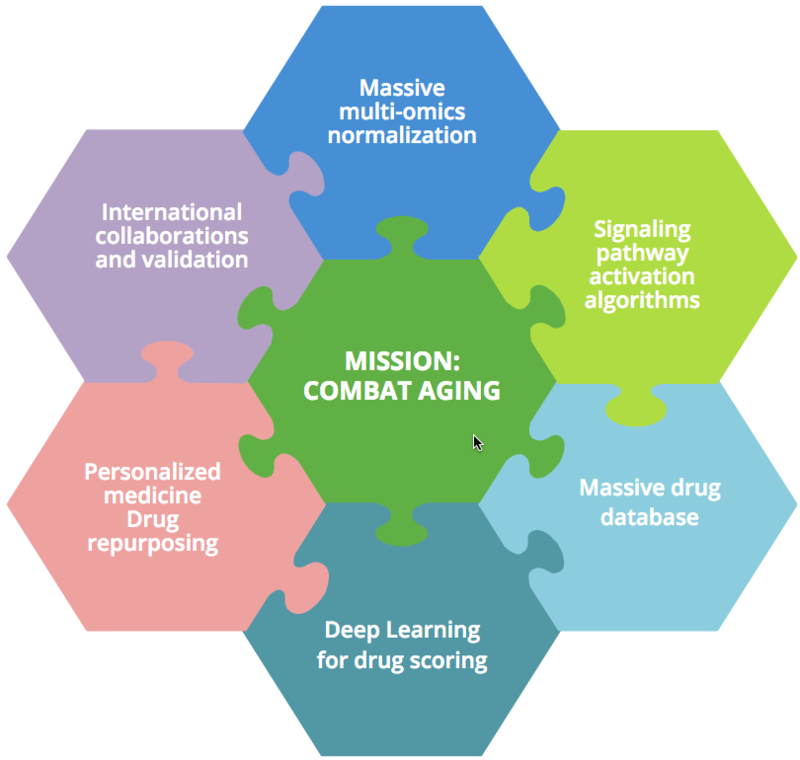 Insilico Medicine says it aims to address these reasons by developing “multimodal deep-learned and parametric biomarkers,” as well as multiple drug-scoring pipelines for drug discovery and drug repurposing, and hypothesis and lead generation. “At Insilico, we want to radically transform the pharmaceutical industry and double the number of drugs on the market, using artificial intelligence and deep understanding of pharmaceutical R&D processes,” said Polina Mamoshina*, senior research scientist at Insilico Medicine, Inc.
“Using our drug discovery engine, we made thousands of hypotheses and narrowed these down to 800 strong molecule-disease predictions, with efficacy, toxicity, adverse effects, bioavailability and many other parameters,” said Alex Aliper, president of Insilico Medicine, Inc.
As KurzweilAI reported, earlier this month, Insilico Medicine signed an exclusive agreement with Life Extension, a major nutraceutical product vendor, to collaboratively develop a set of geroprotectors — natural products that mimic the healthy young state in multiple old tissues. The goal is to increase the rejuvenation rate of the body and slow down, or even reverse, the aging process. Polina Mamoshina was the lead author on the paper, “Applications of Deep Learning in Biomedicine” in Molecular Pharmaceutics and contributed to another publication, “Deep learning applications for predicting pharmacological properties of drugs and drug repurposing using transcriptomic data” also in Molecular Pharmaceutics. The later paper received the Editors’ Choice Award from the American Chemical Society. She also co-authored a paper, “Deep biomarkers of human aging: Application of deep neural networks to biomarker development” in Aging, one of the highest-impact journals in aging research. Columbia Engineering researchers announced earlier this week that they have developed a simple way to reduce VR motion sickness that can be applied to existing consumer VR devices, such as Oculus Rift, HTC Vive, Sony PlayStation VR, Gear VR, and Google Cardboard devices. The trick is to subtly change the field of view (FOV), or how much of an image you can see, during visually perceived motion. In an experiment conducted by Computer Science Professor Steven K. Feiner and student Ajoy Fernandes, most of the participants were not even aware of the intervention. 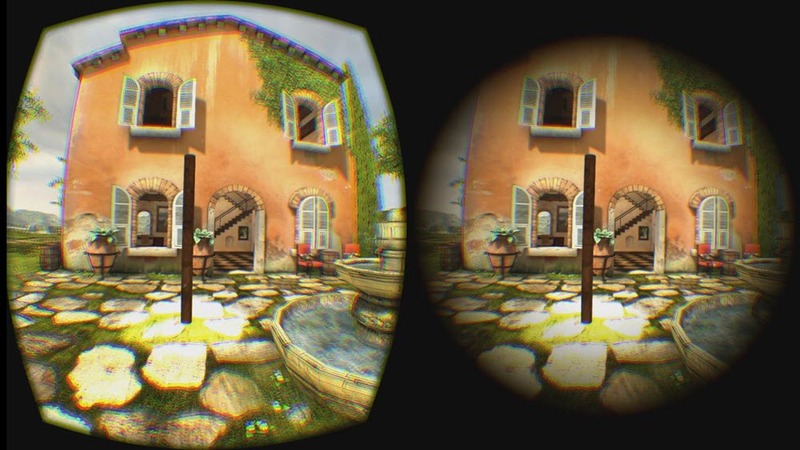 What causes VR sickness is the clash between the visual motion cues that users see and the physical motion cues that they receive from their inner ears’ vestibular system, which provide our sense of motion, equilibrium, and spatial orientation. When the visual and vestibular cues conflict, users can feel quite uncomfortable, even nauseated. Decreasing the field of view can decrease these symptoms, but can also decrease the user’s sense of presence (reality) in the virtual environment, making the experience less compelling. So the researchers worked on subtly decreasing FOV in situations when a larger FOV would be likely to cause VR sickness (when the mismatch between physical and virtual motion increases) and restoring the FOV when VR sickness is less likely to occur (when the mismatch decreases). They developed software that functions as a pair of “dynamic FOV restrictors” that can partially obscure each eye’s view with a virtual soft-edged cutout. They then determined how much the user’s field of view should be reduced, and the speed with which it should be reduced and then restored, and tested the system in an experiment. Most of the experiment participants who used the restrictors did not notice them, and all those who did notice them said they would prefer to have them in future VR experiences. The study was presented at IEEE 3DUI 2016 (IEEE Symposium on 3D User Interfaces) on March 20, where it won the Best Paper Award. A different, more ambitious approach was announced in March by vMocion, LLC, an entertainment technology company, based on the Mayo Clinic‘s patented Galvanic Vestibular Stimulation (GVS) technology*, which electrically stimulates the vestibular system. vMocion’s new 3v Platform (virtual, vestibular and visual) was actually developed to add a “magical” sensation of motion in existing gaming, movies, amusement parks and other entertainment environments. But it turns out GVS also works to reduce VR motion sickness. vMocion says it will license the 3v Platform to VR and other media and entertainment companies. The system’s software that can be integrated into existing operating systems, and added to existing devices such as head-mounted devices — along with smartphones, 3-D glasses and TVs, says Bradley Hillstrom Jr., CEO of vMocion. “vMocion is are already in talks with companies in the gaming and entertainment industries,” Hillstrom told KurzweilAI, “and we hope to work with systems integrators and other strategic partners who can bring this technology directly to consumers very soon.” Hillstrom said the technology can be integrated into existing headsets and other devices. Samsung has announced plans to sell a system using GVS, called Entrim 4D, although it’s not clear from the video (showing a Gear VR device) how it connects to the front and rear electrodes (apparently needed for pitch sensations). 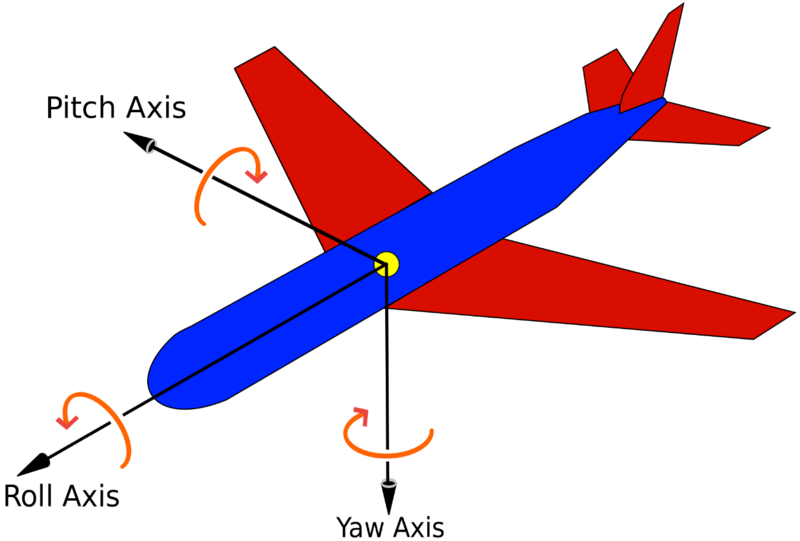 * The technology grew out of decade-long medical research by Mayo Clinic’s Aerospace Medicine and Vestibular Research Laboratory (AMVRL) team, which consists of experts in aerospace medicine, internal medicine and computational science, as well as neurovestibular specialists, in collaboration with Vivonics, Inc., a biomedical engineering company. The technology is based on work supported by the grants from U.S. Army and U.S. Navy. Virtual Reality (VR) sickness can cause intense discomfort, shorten the duration of a VR experience, and create an aversion to further use of VR. High-quality tracking systems can minimize the mismatch between a user’s visual perception of the virtual environment (VE) and the response of their vestibular system, diminishing VR sickness for moving users. However, this does not help users who do not or cannot move physically the way they move virtually, because of preference or physical limitations such as a disability. It has been noted that decreasing field of view (FOV) tends to decrease VR sickness, though at the expense of sense of presence. To address this tradeoff, we explore the effect of dynamically, yet subtly, changing a physically stationary person’s FOV in response to visually perceived motion as they virtually traverse a VE. We report the results of a two-session, multi-day study with 30 participants. Each participant was seated in a stationary chair, wearing a stereoscopic head-worn display, and used control and FOV-modifying conditions in the same VE. Our data suggests that by strategically and automatically manipulating FOV during a VR session, we can reduce the degree of VR sickness perceived by participants and help them adapt to VR, without decreasing their subjective level of presence, and minimizing their awareness of the intervention. UT Dallas researchers have designed an affordable “electronic nose” radio-frequency front end for a rotational spectrometer — used for detecting chemical molecules in human breath for health diagnosis. Current breath-analysis devices are bulky and too costly for commercial use, said Kenneth O, PhD, a principal investigator of the effort and director of Texas Analog Center of Excellence (TxACE). Instead, the researchers used CMOS integrated circuits technology, which promises to make the device compact and affordable. A rotational spectrometer generates and transmits electromagnetic waves over a wide range of frequencies, and analyzes how the waves are attenuated (absorbed) to determine what chemicals are present, as well as their concentrations in a sample. The system can detect low levels of chemicals present in human breath. A breath test contains information about practically every part of a human body, but an electronic nose can detect gas molecules with more specificity and sensitivity than breathalyzers, which can confuse acetone for ethanol (the active ingredient of alcoholic drinks) in the breath, for example. This is important for patients with Type 1 diabetes, who have high concentrations of acetone in their breath. The current research focuses on the design of a 200–280 GHz transmitter radio-frequency front end. The researchers envision that the CMOS-based device will first be used in industrial settings, and then in doctors’ offices and hospitals. As the technology matures, the devices could be used in homes. Dr. O said the need for blood work and gastrointestinal tests, for example, could be reduced, and diseases could be detected earlier, lowering the costs of health care. The researchers plan to have a prototype programmable electronic nose available for beta testing in early 2018. The research is supported by the Semiconductor Research Corporation, Texas Instruments, and Samsung Global Research Outreach. The research team includes members at UT Southwestern, Ohio State University, and Wright State University. The research was presented Wednesday in an open-access paperat the 2016 IEEE Symposia on VLSI Technology and Circuits in Honolulu, Hawaii. The post Protected: ACADEMICS UPDATE FOR JUNE 17, 2016 appeared first on Singularity University. Harvard scientists have created a system a system that uses solar energy plus hydrogen-eating bacteria to produce liquid fuels with 10 percent efficiency, compared to the 1 percent seen in the fastest-growing plants. The system, co-created by Daniel Nocera, the Patterson Rockwood Professor of Energy at Harvard University, and Pamela Silver, the Elliott T. and Onie H. Adams Professor of Biochemistry and Systems Biology at Harvard Medical School, uses solar energy to split water molecules into hydrogen and oxygen molecules. A paper on the research was published June 3 in Science. Dubbed “bionic leaf 2.0,” the new system builds on previous work by Nocera, Silver and others, which faced a number of challenges. Mainly, the catalyst they used to produce hydrogen (a nickel-molybdenum-zinc alloy) also created reactive oxygen species — molecules that attacked and destroyed the bacteria’s DNA. To avoid that problem, researchers were forced to run the system at abnormally high voltages, resulting in reduced efficiency. Nocera and colleagues were also able to expand the portfolio of the system to include isobutanol (a solvent) and isopentanol (used in geothermal power production to drive turbines), along with PHB, a bioplastic precursor. The new catalyst’s chemical design also allows it to “self-heal,” meaning it won’t leach material into solution — it’s biologically compatible. Working in conjunction with the First 100 Watts Project at Harvard, which helped fund the research, Nocera hopes to continue developing the technology and its applications in nations such as India with the help of that country’s scientists. 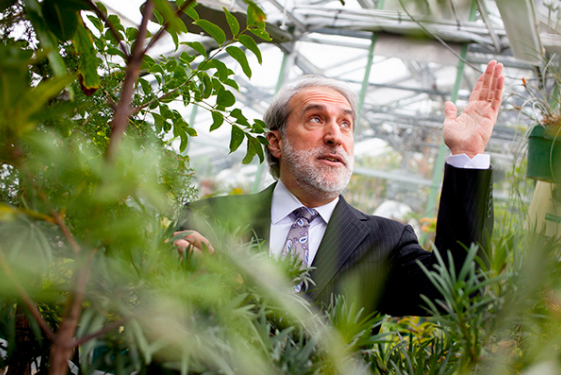 In many ways, Nocera said, the new system marks fulfillment of the promise of his “artificial leaf,” which used solar power to split water and make hydrogen fuel (see ‘Artificial leaf’ harnesses sunlight for efficient, safe hydrogen fuel production). The work, a direct result of the First 100 Watts Project established at Harvard University, was was supported by Office of Naval Research Multidisciplinary University, Research Initiative Award, Air Force Office of Scientific Research Grant, and the Wyss Institute for Biologically Inspired Engineering. 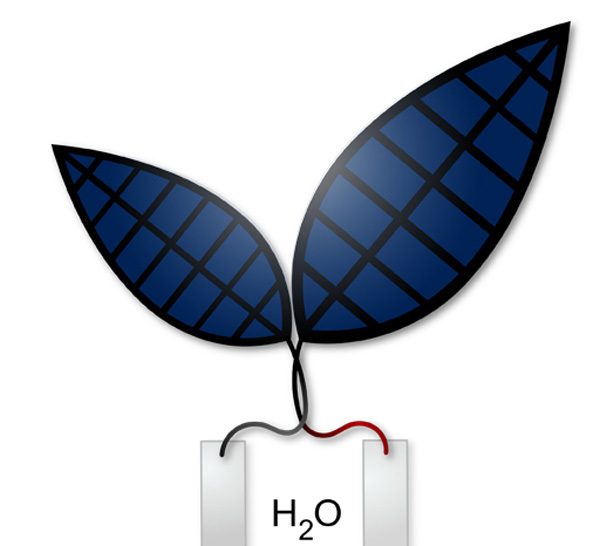 The Harvard University Climate Change Solutions Fund is supporting ongoing research into the “bionic leaf” platform. Artificial photosynthetic systems can store solar energy and chemically reduce CO2. We developed a hybrid water splitting–biosynthetic system based on a biocompatible Earth-abundant inorganic catalyst system to split water into molecular hydrogen and oxygen (H2 and O2) at low driving voltages. When grown in contact with these catalysts, Ralstonia eutropha consumed the produced H2 to synthesize biomass and fuels or chemical products from low CO2 concentration in the presence of O2. 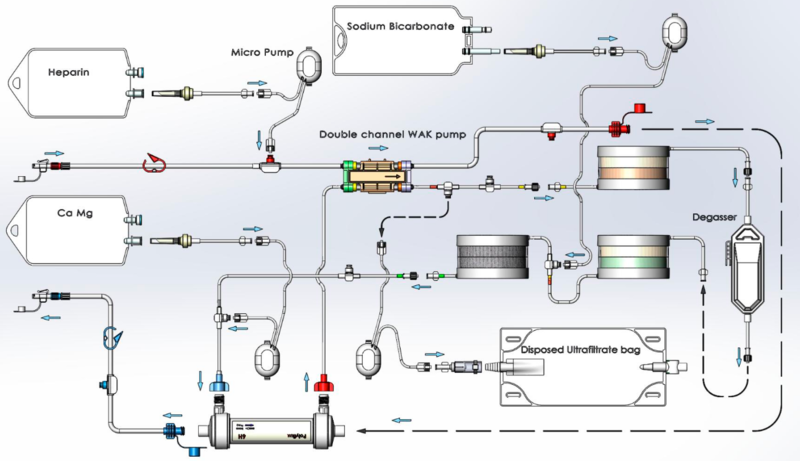 This scalable system has a CO2 reduction energy efficiency of ~50% when producing bacterial biomass and liquid fusel alcohols, scrubbing 180 grams of CO2 per kilowatt-hour of electricity. Coupling this hybrid device to existing photovoltaic systems would yield a CO2 reduction energy efficiency of ~10%, exceeding that of natural photosynthetic systems. 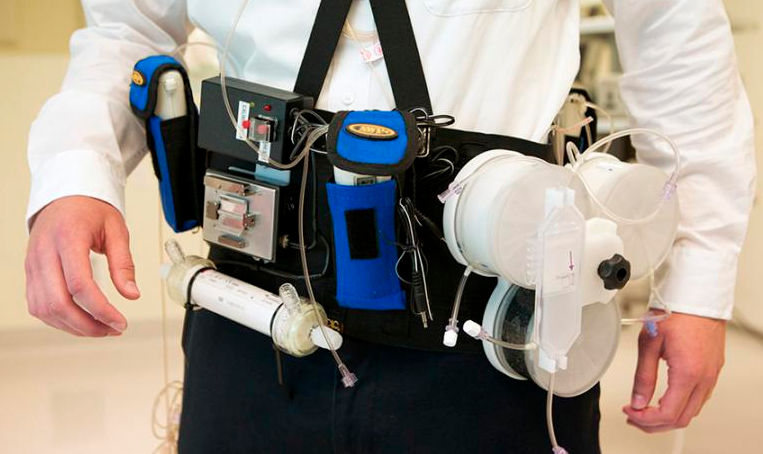 An FDA-approved exploratory clinical trial of a prototype wearable artificial kidney (WAK) — a miniaturized, wearable hemodialysis machine — at the University of Washington Medical Center in Seattle has been completed, the researchers reported June 2 in an open-access paper in JCI Insight. The seven patients enrolled in the study reported “significantly greater treatment satisfaction during the WAK treatment period compared with ratings of care during periods of conventional in-center hemodialysis treatment,” according to the researchers. “During the study, hemodynamic parameters remained stable, ultrafiltration was achieved as intended, and there were no unexpected adverse treatment effects.” The study was led by the device inventor, Victor Gura, M.D., of Cedars-Sinai Medical Center in Los Angeles and Blood Purification Technologies Inc. The trial was stopped after the seventh subject due to device-related technical problems, including excessive carbon dioxide bubbles in the dialysate circuit and variable blood and dialysate flows, which the scientists plan to fix. More than 2 million people worldwide experience end-stage renal disease (ESRD), which is currently treated with hemodialysis therapies that require patients to adhere to restrictive dietary and fluid intake limitations and are associated with a high pill burden, according to the researchers. Adjusted rates of all-cause mortality are up to 8 times greater for dialysis patients compared with age-matched individuals in the general population, they note. The WAK is designed to be worn and used by patients for up to 24 hours per day. The hope is that treatment can be administered at the patients’ homes either by the patients themselves or caretakers. 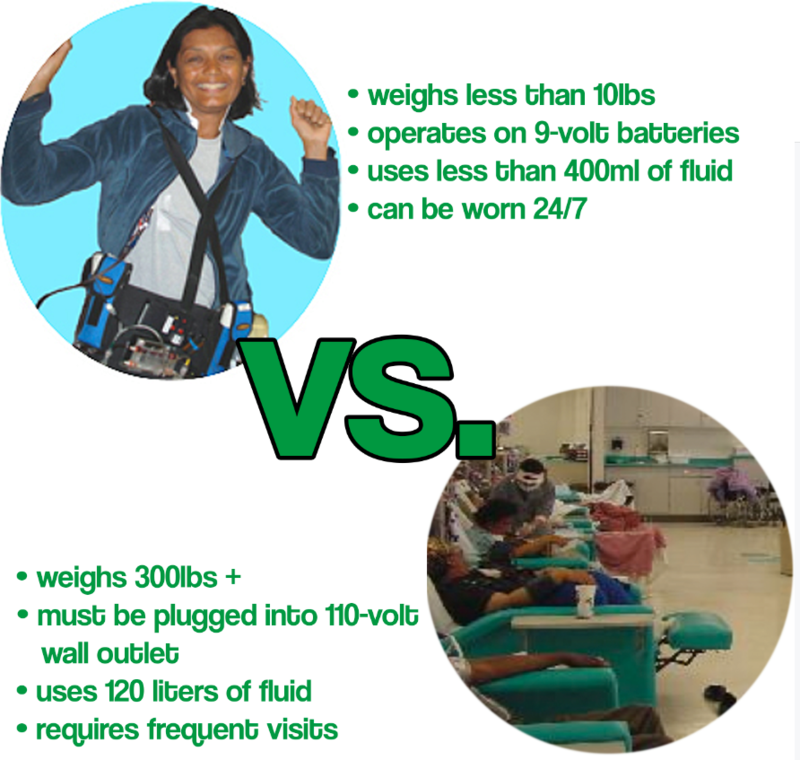 Being able to be ambulatory while undergoing dialysis, if further proven in additional studies, “would liberate patients from the need to be tethered to a stationary machine during dialysis treatments,” according to the researchers. To learn more or donate, contact Wearable Artifical Kidney Foundation, which funded the study along with Blood Purification Technologies Inc.
MIT researchers have developed synthetic biological circuits that combine both analog (continuous) and digital (discrete) computation — allowing living cells to carry out complex processing operations, such as releasing a drug in response to low glucose levels. The research is presented in an open-access paper published in the journal Nature Communications. Like electronic circuits, living cells are capable of performing computations that are either continuous (analog) — like the way eyes adjust to gradual changes in the light levels — or digital, involving simple discrete on or off processes, such as a cell’s self-programmed death (apoptosis). Current synthetic biological systems, in contrast, have tended to focus on either analog or digital processing, limiting the range of uses. “Most of the work in synthetic biology has focused on the digital approach, because [digital systems] are much easier to program,” says Timothy Lu, an associate professor of electrical engineering and computer science and of biological engineering, and head of the Synthetic Biology Group at MIT’s Research Laboratory of Electronics. The new synthetic circuits can measure the level of an analog input, such as a particular chemical relevant to a disease, and then make a binary decision — for example, turning on an output, such as a drug that treats the disease if the level is in the right range. If the concentration of the chemical reaches a certain level, the threshold module expresses the recombinase gene, causing it to flip the DNA segment (which contains a gene or gene-regulatory element, which then alters the expression of a desired output). “So this is how we take an analog input, such as a concentration of a chemical, and convert it into a 0 or 1 signal,” Lu says. “And once that is done, and you have a piece of DNA that can be flipped upside down, then you can put together any of those pieces of DNA to perform digital computing,” he says. The team has also built an analog-to-digital converter circuit that implements ternary (three-valued) logic. The circuit, which is capable of producing two different outputs, will only switch on in response to either a high or low concentration range of an input. In the future, the circuit could be used to detect glucose levels in the blood and respond in one of three ways depending on the concentration, he says. “If the glucose level was too high, you might want your cells to produce insulin, if the glucose was too low you might want them to make glucagon, and if it was in the middle you wouldn’t want them to do anything,” he says. Similar analog-to-digital converter circuits could also be used to detect a variety of chemicals, simply by changing the sensor, Lu says. The researchers are investigating the idea of using analog-to-digital converters to detect levels of inflammation in the gut caused by inflammatory bowel disease, for example, and releasing different amounts of a drug in response. Immune cells used in cancer treatment could also be engineered to detect different environmental inputs, such as oxygen or tumor lysis (cell breakdown) levels, and vary the immune-call therapeutic activity in response. Other research groups are also interested in using the devices for environmental applications, such as engineering cells that detect concentrations of water pollutants, Lu says. 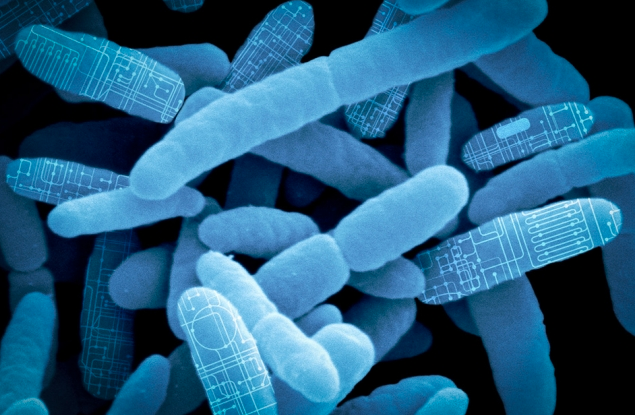 The research team recently created a spinout company, called Synlogic, which is now attempting to use simple versions of the circuits to engineer probiotic bacteria that can treat diseases in the gut. The company hopes to begin clinical trials of these bacteria-based treatments within the next 12 months. Living cells implement complex computations on the continuous environmental signals that they encounter. These computations involve both analogue- and digital-like processing of signals to give rise to complex developmental programs, context-dependent behaviours and homeostatic activities. In contrast to natural biological systems, synthetic biological systems have largely focused on either digital or analogue computation separately. Here we integrate analogue and digital computation to implement complex hybrid synthetic genetic programs in living cells. We present a framework for building comparator gene circuits to digitize analogue inputs based on different thresholds. We then demonstrate that comparators can be predictably composed together to build band-pass filters, ternary logic systems and multi-level analogue-to-digital converters. In addition, we interface these analogue-to-digital circuits with other digital gene circuits to enable concentration-dependent logic. We expect that this hybrid computational paradigm will enable new industrial, diagnostic and therapeutic applications with engineered cells. 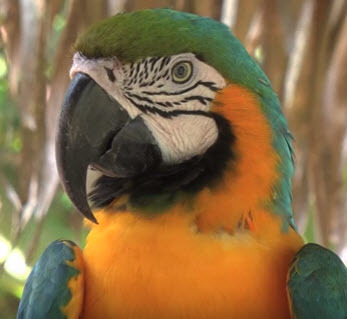 Are you smarter than a macaw? The first study to systematically measure the number of neurons in the brains of more than two dozen species of birds has found that the birds that were studied consistently have more neurons packed into their small brains than those in mammalian or even primate brains of the same mass. The study results were published online in an open-access paper in the Proceedings of the National Academy of Sciences early edition on the week of June 13. “For a long time having a ‘bird brain’ was considered to be a bad thing. Now it turns out that it should be a compliment,” said Vanderbilt University neuroscientist Suzana Herculano-Houzel, senior author of the paper with Pavel Němec at the Charles University in Prague. The study answers a puzzle that comparative neuroanatomists have been wrestling with for more than a decade: How can birds with their small brains perform complicated cognitive behaviors? The conundrum was created by a series of studies beginning in the previous decade that directly compared the cognitive abilities of parrots and crows with those of primates. The studies found that the birds could manufacture and use tools, use insight to solve problems, make inferences about cause-effect relationships, recognize themselves in a mirror, and plan for future needs, among other cognitive skills previously considered the exclusive domain of primates. So scientists assumed avian brains must be wired differently from primate brains. Two years ago, even this hypothesis was knocked down by a detailed study of pigeon brains, which concluded that they are, in fact, organized along quite similar lines to those of primates. The new study provides a plausible explanation: Birds can perform these complex behaviors because birds’ forebrains contain a lot more neurons than any one had previously thought — as many as in mid-sized primates. “We found that birds, especially songbirds and parrots, have surprisingly large numbers of neurons in their pallium: the part of the brain that corresponds to the cerebral cortex, which supports higher cognition functions such as planning for the future or finding patterns. That explains why they exhibit levels of cognition at least as complex as primates,” said Herculano-Houzel. That’s because the neurons in avian brains are much smaller and more densely packed than those in mammalian brains, the study found. Parrot and songbird brains, for example, contain about twice as many neurons as primate brains of the same mass and two to four times as many neurons as equivalent rodent brains. Also, the proportion of neurons in the forebrain is significantly higher, the study found. Although she acknowledges that the relationship between intelligence and neuron count has not yet been firmly established, Herculano-Houzel and her colleagues argue that having the same or greater forebrain neuron counts than primates with much larger brains can potentially provide the birds with much higher “cognitive power” per pound than mammals. In other words, there’s more than one way to build better brains. Previously, neuroanatomists thought that as brains grew larger, neurons had to grow bigger as well because they had to connect over longer distances. “But bird brains show that there are other ways to add neurons: Keep most neurons small and locally connected and only allow a small percentage to grow large enough to make the longer connections. This keeps the average size of the neurons down,” she explained. Does the surprisingly large number of neurons in bird brains comes at a correspondingly large energetic cost? Are the small neurons in bird brains a response to selection for small body size due to flight, or possibly the ancestral way of adding neurons to the brain — from which mammals, not birds, may have diverged. 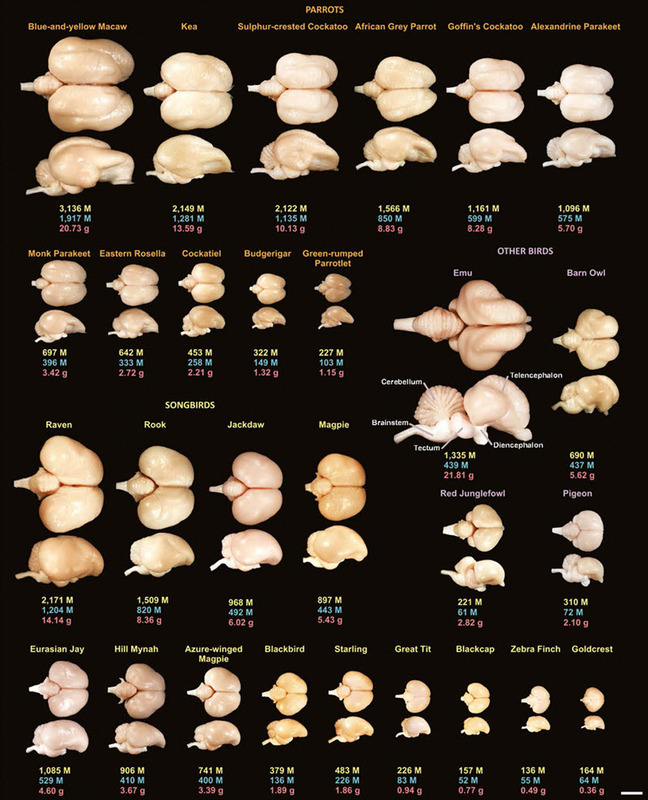 Herculano-Houzel hopes that the results of the study and the questions it raises will stimulate other neuroscientists to begin exploring the mysteries of the avian brain, especially how their behavior compares to that of mammals of similar numbers of neurons or brain size. Researchers at Charles University in Prague and the University of Vienna were also involved in the study. Some birds achieve primate-like levels of cognition, even though their brains tend to be much smaller in absolute size. This poses a fundamental problem in comparative and computational neuroscience, because small brains are expected to have a lower information-processing capacity. 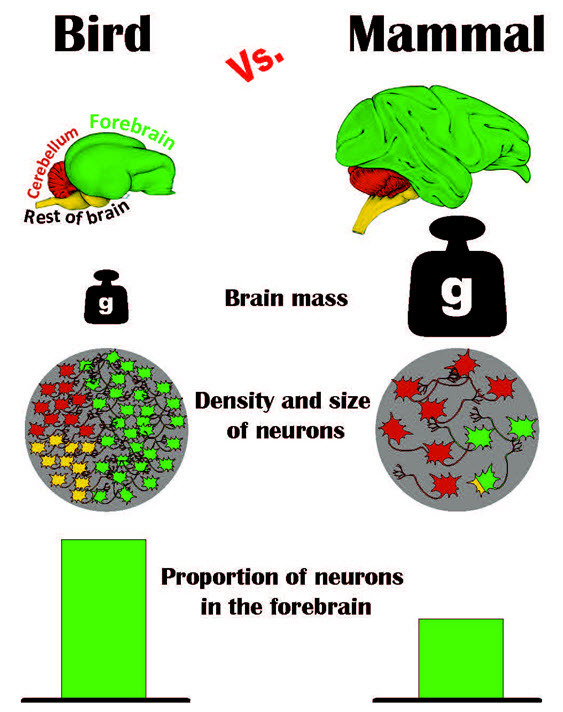 Using the isotropic fractionator to determine numbers of neurons in specific brain regions, here we show that the brains of parrots and songbirds contain on average twice as many neurons as primate brains of the same mass, indicating that avian brains have higher neuron packing densities than mammalian brains. Additionally, corvids and parrots have much higher proportions of brain neurons located in the pallial telencephalon compared with primates or other mammals and birds. Thus, large-brained parrots and corvids have forebrain neuron counts equal to or greater than primates with much larger brains. We suggest that the large numbers of neurons concentrated in high densities in the telencephalon substantially contribute to the neural basis of avian intelligence. The SingularityU NZ Summit brings the world’s top speakers and experts on exponentially accelerating technologies together with New Zealand’s and Australia’s leaders of today and tomorrow, giving us the knowledge and insight we need to compete — and win — in an exponentially changing world. To learn more, click here. NOV 14-16 appeared first on Singularity University. A meta-analysis of 45 studies (64 publications) of consumption of whole grain by an international team of researchers, led by Dagfinn Aune, PhD, at Imperial College London, found lower risks of coronary heart disease and cardiovascular disease overall, as well as deaths from all causes and from specific diseases, including stroke, cancer, diabetes, infectious and respiratory diseases. The results have been published in an open-access paper in the British Medical Journal (BMJ). The greatest benefit was seen for people who increased from no intake of whole grain to two servings per day, equivalent to 32 g/day, such as 32 g of whole grain wheat, or to 60 g product/day, such as 60 g of whole grain wheat bread. A large body of evidence has emerged on the health benefits of whole grain foods over the last 10–15 years. Grains are one of the major staple foods worldwide and provide on average 56% of energy intake and 50% of protein intake. Reductions in risks of cardiovascular disease and all-cause mortality were associated with intake of whole grain bread, whole grain breakfast cereals, and added bran, as well as total intake of bread and breakfast cereals. However, the researchers noted that systematic reviews and meta-analyses involving observational research cannot be used to draw conclusions about cause and effect. They call for more research to determine health benefits of different types of whole grain in different geographical regions, as most of the current evidence is from the U.S. and fewer studies have been conducted in Europe, Asia and other regions. Studies of specific diseases, and less common causes of deaths, are needed. * They included more than 7,000 cases of coronary heart disease, 2,000 cases of stroke, 26,000 cases of cardiovascular disease, 34,000 deaths from cancer, and 100,000 deaths among 700,000 participants. Objective To quantify the dose-response relation between consumption of whole grain and specific types of grains and the risk of cardiovascular disease, total cancer, and all cause and cause specific mortality. Data sources PubMed and Embase searched up to 3 April 2016. 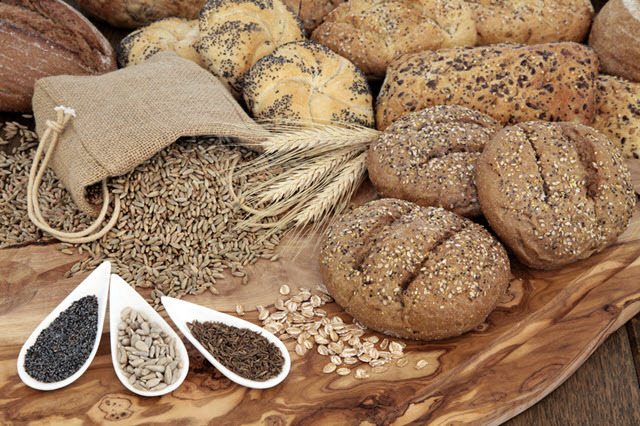 Study selection Prospective studies reporting adjusted relative risk estimates for the association between intake of whole grains or specific types of grains and cardiovascular disease, total cancer, all cause or cause specific mortality. Data synthesis Summary relative risks and 95% confidence intervals calculated with a random effects model. Results 45 studies (64 publications) were included. The summary relative risks per 90 g/day increase in whole grain intake (90 g is equivalent to three servings—for example, two slices of bread and one bowl of cereal or one and a half pieces of pita bread made from whole grains) was 0.81 (95% confidence interval 0.75 to 0.87; I2=9%, n=7 studies) for coronary heart disease, 0.88 (0.75 to 1.03; I2=56%, n=6) for stroke, and 0.78 (0.73 to 0.85; I2=40%, n=10) for cardiovascular disease, with similar results when studies were stratified by whether the outcome was incidence or mortality. The relative risks for morality were 0.85 (0.80 to 0.91; I2=37%, n=6) for total cancer, 0.83 (0.77 to 0.90; I2=83%, n=11) for all causes, 0.78 (0.70 to 0.87; I2=0%, n=4) for respiratory disease, 0.49 (0.23 to 1.05; I2=85%, n=4) for diabetes, 0.74 (0.56 to 0.96; I2=0%, n=3) for infectious diseases, 1.15 (0.66 to 2.02; I2=79%, n=2) for diseases of the nervous system disease, and 0.78 (0.75 to 0.82; I2=0%, n=5) for all non-cardiovascular, non-cancer causes. Reductions in risk were observed up to an intake of 210-225 g/day (seven to seven and a half servings per day) for most of the outcomes. Intakes of specific types of whole grains including whole grain bread, whole grain breakfast cereals, and added bran, as well as total bread and total breakfast cereals were also associated with reduced risks of cardiovascular disease and/or all cause mortality, but there was little evidence of an association with refined grains, white rice, total rice, or total grains. Conclusions This meta-analysis provides further evidence that whole grain intake is associated with a reduced risk of coronary heart disease, cardiovascular disease, and total cancer, and mortality from all causes, respiratory diseases, infectious diseases, diabetes, and all non-cardiovascular, non-cancer causes. These findings support dietary guidelines that recommend increased intake of whole grain to reduce the risk of chronic diseases and premature mortality. New research suggests why the human brain and other biological networks exhibit a hierarchical structure, and the study may improve attempts to create artificial intelligence. The study, by researchers from the University of Wyoming and the French Institute for Research in Computer Science and Automation (INRIA, in France), demonstrates that the evolution of hierarchy — a simple system of ranking — in biological networks may arise because of the costs associated with network connections. This study also supports Ray Kurzweil’s theory of the hierarchical structure of the neocortex, presented in his 2012 book, How to Create a Mind. The human brain has separate areas for vision, motor control, and tactile processing, for example, and each of these areas consist of sub-regions that govern different parts of the body. The research findings suggest that hierarchy evolves not because it produces more efficient networks, but instead because hierarchically wired networks have fewer connections. That’s because connections in biological networks are expensive — they have to be built, maintained, etc. — so there’s an evolutionary pressure to reduce the number of connections. In addition to shedding light on the emergence of hierarchy across the many domains in which it appears, these findings may also accelerate future research into evolving more complex, intelligent computational brains in the fields of artificial intelligence and robotics. The research, led by Henok S. Mengistu, is described in an open-access paper in PLOS Computational Biology. The researchers also simulated the evolution of computational brain models, known as artificial neural networks, both with and without a cost for network connections. They found that hierarchical structures emerge much more frequently when a cost for connections is present. Aside from explaining why biological networks are hierarchical, the research might also explain why many man-made systems such as the Internet and road systems are also hierarchical. “The next step is to harness and combine this knowledge to evolve large-scale, structurally organized networks in the hopes of creating better artificial intelligence and increasing our understanding of the evolution of animal intelligence, including our own,” according to the researchers. Hierarchical organization—the recursive composition of sub-modules—is ubiquitous in biological networks, including neural, metabolic, ecological, and genetic regulatory networks, and in human-made systems, such as large organizations and the Internet. To date, most research on hierarchy in networks has been limited to quantifying this property. However, an open, important question in evolutionary biology is why hierarchical organization evolves in the first place. It has recently been shown that modularity evolves because of the presence of a cost for network connections. Here we investigate whether such connection costs also tend to cause a hierarchical organization of such modules. In computational simulations, we find that networks without a connection cost do not evolve to be hierarchical, even when the task has a hierarchical structure. However, with a connection cost, networks evolve to be both modular and hierarchical, and these networks exhibit higher overall performance and evolvability (i.e. faster adaptation to new environments). Additional analyses confirm that hierarchy independently improves adaptability after controlling for modularity. Overall, our results suggest that the same force–the cost of connections–promotes the evolution of both hierarchy and modularity, and that these properties are important drivers of network performance and adaptability. In addition to shedding light on the emergence of hierarchy across the many domains in which it appears, these findings will also accelerate future research into evolving more complex, intelligent computational brains in the fields of artificial intelligence and robotics. Boosting the transport of mitochondria (cell energy suppliers) along neuronal axons enhances the ability of mouse nerve cells to repair themselves and regrow after injury or disease, researchers at the National Institute of Neurological Disorders and Stroke report in The Journal of Cell Biology. Neurons need large amounts of energy to extend their axons long distances through the body. This energy — in the form of adenosine triphosphate (ATP) — is provided by mitochondria. During development, mitochondria are transported up and down growing axons to generate ATP wherever it is needed. In adults, however, mitochondria become less mobile as mature neurons produce a protein called syntaphilin that anchors the mitochondria in place. Zu-Hang Sheng and colleagues at the National Institute of Neurological Disorders and Stroke wondered whether this decrease in mitochondrial transport might explain why adult neurons are typically unable to regrow after injury. They initially found that when mature mouse axons are severed, nearby mitochondria are damaged and become unable to provide sufficient ATP to support injured nerve regeneration. However, when the researchers experimentally removed syntaphilin from the nerve cells (by using a genetically modified mouse), mitochondrial transport was enhanced, allowing the damaged mitochondria to be replaced by healthy mitochondria capable of producing ATP. The Syntaphilin-deficient mature neurons therefore regained the ability to regrow after injury, just like young neurons. “Our in vivo and in vitro studies suggest that activating an intrinsic growth program requires the coordinated modulation of mitochondrial transport and recovery of energy deficits. Such combined approaches may represent a valid therapeutic strategy to facilitate regeneration in the central and peripheral nervous systems after injury or disease,” Sheng says. Although neuronal regeneration is a highly energy-demanding process, axonal mitochondrial transport progressively declines with maturation. Mature neurons typically fail to regenerate after injury, thus raising a fundamental question as to whether mitochondrial transport is necessary to meet enhanced metabolic requirements during regeneration. Here, we reveal that reduced mitochondrial motility and energy deficits in injured axons are intrinsic mechanisms controlling regrowth in mature neurons. Axotomy induces acute mitochondrial depolarization and ATP depletion in injured axons. Thus, mature neuron-associated increases in mitochondria-anchoring protein syntaphilin (SNPH) and decreases in mitochondrial transport cause local energy deficits. Strikingly, enhancing mitochondrial transport via genetic manipulation facilitates regenerative capacity by replenishing healthy mitochondria in injured axons, thereby rescuing energy deficits. An in vivo sciatic nerve crush study further shows that enhanced mitochondrial transport in snph knockout mice accelerates axon regeneration. 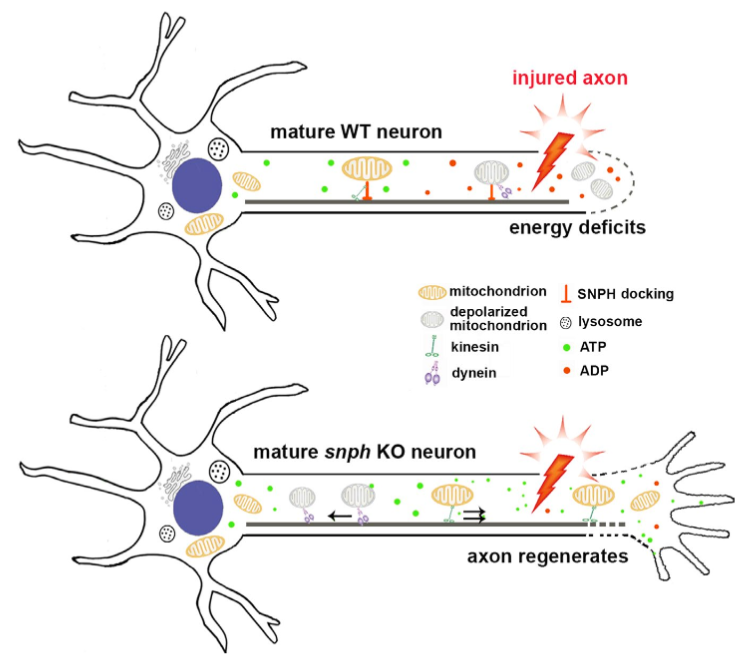 Understanding deficits in mitochondrial trafficking and energy supply in injured axons of mature neurons benefits development of new strategies to stimulate axon regeneration. Small electrical currents appear to activate certain immune cells to jumpstart or speed wound healing and reduce infection when there’s a lack of immune cells available, such as with diabetes, University of Aberdeen (U.K.) scientists have found. “These findings raise the prospect that EF-based therapies could be extended beyond tissue repair and ultimately, be exploited to modulate the function of macrophages in other inflammatory diseases where these cells are dysregulated,” the researchers note in a report appearing in the June 2016 issue of the Journal of Leukocyte Biology. “This new work identifies previously unappreciated opportunities to tune immune system function with electrical fields and has potentially wide-reaching implications for wound repair for a variety of diseases where macrophages play a role, including infectious disease, cancer and even obesity,” said John Wherry, Ph.D., Deputy Editor of the Journal of Leukocyte Biology. The research extends previous research reported by KurzweilAI (New evidence that electrical stimulation accelerates wound healing). * The experiments also showed that electric fields selectively augmented the production of protein modulators associated with the healing process, enhancing cytokine (growth factor) production and phagocytic activity essential for clearance of infection and for tissue repair and confirming that macrophages are tuned to respond to naturally generated electrical signals in a manner that boosts their healing ability. Macrophages are key cells in inflammation and repair, and their activity requires close regulation. The characterization of cues coordinating macrophage function has focused on biologic and soluble mediators, with little known about their responses to physical stimuli, such as the electrical fields that are generated naturally in injured tissue and which accelerate wound healing. To address this gap in understanding, we tested how properties of human monocyte-derived macrophages are regulated by applied electrical fields, similar in strengths to those established naturally. With the use of live-cell video microscopy, we show that macrophage migration is directed anodally by electrical fields as low as 5 mV/mm and is electrical field strength dependent, with effects peaking ∼300 mV/mm. Monocytes, as macrophage precursors, migrate in the opposite, cathodal direction. Strikingly, we show for the first time that electrical fields significantly enhance macrophage phagocytic uptake of a variety of targets, including carboxylate beads, apoptotic neutrophils, and the nominal opportunist pathogen Candida albicans, which engage different classes of surface receptors. These electrical field-induced functional changes are accompanied by clustering of phagocytic receptors, enhanced PI3K and ERK activation, mobilization of intracellular calcium, and actin polarization. Electrical fields also modulate cytokine production selectively and can augment some effects of conventional polarizing stimuli on cytokine secretion. Taken together, electrical signals have been identified as major contributors to the coordination and regulation of important human macrophage functions, including those essential for microbial clearance and healing. Our results open up a new area of research into effects of naturally occurring and clinically applied electrical fields in conditions where macrophage activity is critical. Finnish researchers have developed a method for building highly efficient miniaturized micro-supercapacitor energy storage directly inside a silicon microcircuit chip, making it possible to power autonomous sensor networks, wearable electronics, and mobile internet-of-things (IoT) devices. Supercapacitors function similar to standard batteries, but store electrostatic energy instead of chemical energy. The researchers at VTT Technical Research Centre of Finland have developed a hybrid nano-electrode that’s only a few nanometers thick. It consists of porous silicon coated with a titanium nitride layer formed by atomic layer deposition. The nano-electrode design features the highest-ever conductive surface-to-volume ratio. That combined with an ionic liquid (in a microchannel formed in between two electrodes), results in an extremely small form factor and efficient energy storage. That design makes it possible for a silicon-based micro-supercapacitor to achieve higher energy storage (energy density) and faster charge/discharge (power density) than the leading carbon- and graphene-based supercapacitors, according to the researchers. The micro-supercapacitor can store 0.2 joule (55 microwatts of power for one hour) on a one-square-centimeter silicon chip. This design also leaves the surface of the chip available for active integrated microcircuits and sensors. Micro-supercapacitors can also be integrated directly with active microelectronic devices to store electrical energy generated by thermal, light, and vibration energy harvesters to supply electrical energy (see, for example, Wireless device converts ‘lost’ microwave energy into electric power). An open-access paper on the research has been published in Nano Energy journal. Today’s supercapacitor energy storages are typically discrete devices aimed for printed boards and power applications. The development of autonomous sensor networks and wearable electronics and the miniaturization of mobile devices would benefit substantially from solutions in which the energy storage is integrated with the active device. Nanostructures based on porous silicon (PS) provide a route towards integration due to the very high inherent surface area to volume ratio and compatibility with microelectronics fabrication processes. Unfortunately, pristine PS has limited wettability and poor chemical stability in electrolytes and the high resistance of the PS matrix severely limits the power efficiency. In this work, we demonstrate that excellent wettability and electro-chemical properties in aqueous and organic electrolytes can be obtained by coating the PS matrix with an ultra-thin layer of titanium nitride by atomic layer deposition. Our approach leads to very high specific capacitance (15 F cm−3), energy density (1.3 mWh cm−3), power density (up to 214 W cm−3) and excellent stability (more than 13,000 cycles). 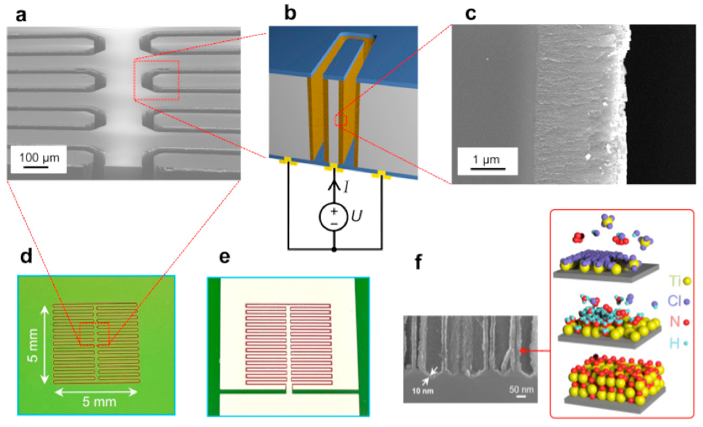 Furthermore, we show that the PS–TiN nanomaterial can be integrated inside a silicon chip monolithically by combining MEMS and nanofabrication techniques. This leads to realization of in-chip supercapacitor, i.e., it opens a new way to exploit the otherwise inactive volume of a silicon chip to store energy. The post Robots are coming for our jobs, but one radical change could make that OK appeared first on Singularity University. Can Crowdsourced Jury Trials On The Blockchain Deliver Justice For All? The post Can Crowdsourced Jury Trials On The Blockchain Deliver Justice For All? appeared first on Singularity University.